Now that you are able to setup session replication in Jelastic for Tomcat, GlassFish and Jetty web servers, you might be interested in how this great feature affects resource usage. Our commercial launch isn’t very far off (really, really close…), and we figured that you would probably like to know a little more about how High Availability affects your resource usage and therefore cost. As a point of information, cost will be dependent on the number of cloudlets in use within Jelastic. 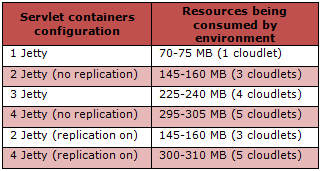 So, whether you use GlassFish, Tomcat 6, Tomcat 7 or Jetty, the tables below will help you understand how the different application servers make use of the cloudlets when High Availability is activated. This open-source application server can run any Java EE application. GlassFish provides enterprise level reliability and performance with full clustering and has a wide functionality range. It is quite cool in that it allows you to manage the central repository via the admin panel, which supports all features available in GlassFish. But as you know, more functions = more resources. 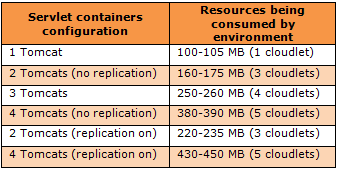 If we compare the 4 different application servers, GlassFish starts looking a little like a resource hog, but its greediness is offset by its functionality, reliability and numerous other advantages. Tomcat 6 is the most popular application server (based on environments created) within our developer community. It provides a “pure Java” HTTP web server environment for Java code to run. Jelastic sets up replication between pairs of Tomcat servers using multicast replication. If one of the instances fails, the users who were on that instance are automatically moved to the other instance in the cluster. If both instances in a cluster were to fail, users would get redirected to another cluster. Jelastic automates the replication configuration, something it does for all the Java application servers it supports. 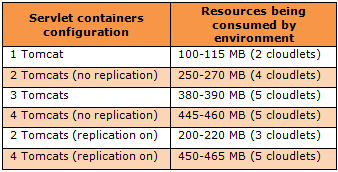 So how are your environment’s resources affected in Tomcat 6? Tomcat 7 is a little more resource intensive, but it’s hard to not like it. It is so easy to create complex web applications with it, pretty much negating the increased percentage in resource consumption over Tomcat 6. Jelastic provides HA for all supported servers. If you want to take advantage of HA, you can choose your server based on either your application needs or how much you want to spend.